Presenting, UDB Villa Grande - an address that is an oasis of calm, peace and magnificence in the hustle-bustle of the city, Jaipur. Your home will now serve as a perfect getaway after a tiring day at work, as UDB Villa Grande ambiance will make you forget that you are in the heart of the city, New Sanganer Road. UDB Villa Grande is a large project spread over an area of 4.30 acres. 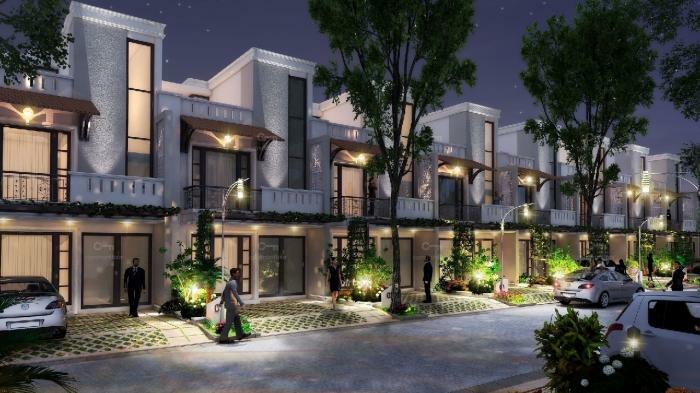 UDB Villa Grande comprises of 3 BHK and 4 BHK Villas in Jaipur. UDB Villa Grande brings a lifestyle that befits Royalty with the batch of magnificent Villas at New Sanganer Road. These Residential Villas in Jaipur offers limited edition luxury boutique houses that amazingly escapes the noise of the city center. UDB Villa Grande is built by a renowned name in construction business, Unique Dream Builders at New Sanganer Road, Jaipur. The floor plan of UDB Villa Grande presents the most exciting and dynamic floor plans designed for a lavish lifestyle with 2 floors. The master plan of UDB Villa Grande offers people a strong connection to their surroundings, promoting a sense of community whilst balancing this with a distinct private address for individual homeowners. Amenities: Out of the many world class facilities, the major amenities in UDB Villa Grande includes Landscaped Garden, Indoor Games, Earthquake Resistant, CCTV Cameras, Swimming Pool, Gymnasium, Play Area, Intercom, Rain Water Harvesting, Waste Disposal, Club House, Convenience Store, Car Parking, Fire Safety, Gated community, Gas Pipeline, Maintenance Staff, 24Hr Backup Electricity, Vaastu / Feng Shui, Multi-purpose Hall, Security and Waste Management System. Location Advantage: There are number of benefits of living in Villas with a good locality. The location of UDB Villa Grande makes sure that the home-seekers are choosing the right Villas for themselves. It is one of the most prestigious address of Jaipur with many facilities and utilities nearby New Sanganer Road. Address: The complete address of UDB Villa Grande is 27, Sachivalya Vihar, New Sanganer Road, Mansarovar, Jaipur, Rajasthan, INDIA.. Unique Dream Builders is one of the leading real estate player in India, They don't only provide luxury real estate for residential buildings but also provide the commercial solution. They have created more than 10+ projects in multiple cities of India. They pride themselves on providing a quality product. They are very passionate to innovate and always provide the most up-to-date technology for their new project. They desire to earn people's trust and confidence while they create whenever they launch their new product and services. The company's main goal is to provide the best real estate in all the areas they serve. Company has impacted largely on the real estate industry in India. UDB has developed many constructed properties with exceptional infrastructural space which has created noteworthy landmarks in Jaipur. The trademark of their developments is contemporary design, innovation, clear & legal titles and scheduled completion. The approach is holistic, combining strategy, planning and methodical research to incorporate together all the specifics of economic, environmental and technological and community. Review of UDB Villa Grande, New Sanganer Road? Its price, location, builder etc. Review of Unique Dream Builders, New Sanganer Road? construction quality, trustworthy, delivery history etc.? Review of UDB Villa Grande, New Sanganer Road location? neighbourhood, connectivity, schools etc.? Comparison of UDB Villa Grande, New Sanganer Road to nearby projects? Is it rightly priced? What is your feedback on this UDB Villa Grande, New Sanganer Road? Depends on brand name and complete the project in time etc? Will this be a better option for investment or to live in UDB Villa Grande, New Sanganer Road? Can you give some suggestion? Is the UDB Villa Grande, New Sanganer Road has more potential in terms of capital appreciation, ROI, Rentals, Proximity to social infrastructure etc?